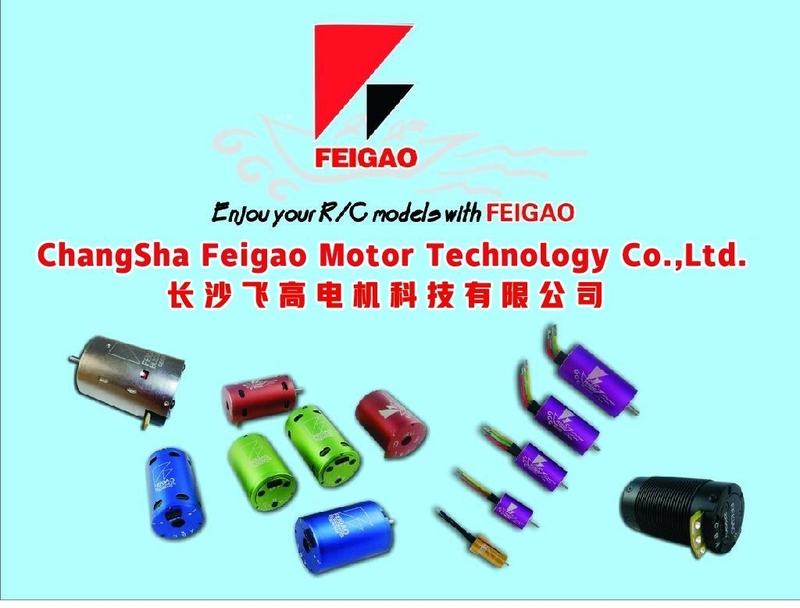 Changsha FEIGAO Motor technology Co., Ltd.
Changsha Feigao Motor Technology Co., Ltd. was founded in 2008, is a manufacturer which is specialised in producing brushless motors, including 120, 130, 280, 380, 540 and 580 series. All motors of the company are manufactured with high quality UHT magnets and copper wires, which makes all brushless motors can work fine with 150℃. 580 series motors employ advanced technology and motor structure, which enhances the efficiency of the motors and makes them very suitable for the large remote control helicopters. 580 series motors would be the best substitution of oil motors. Sensored motors for both 1:10 and 1:8 cars are currently popular products of the company. The company can provide OEM products for customers. Note: We recommend retail customer to purchase our products from authorized distributor/ dealer and their stores. You may get lower price from other channels(such as E-bay), but may have problem to get after sales service. Also,if you didn't get feedback from us after you sent your query. It might caused by our email system. Please try different E-mail address listed below. Sorry for any inconvenience caused.